Health is about way more than just food and fitness. This year I’ve been focusing on small daily changes to improve my body and mind. 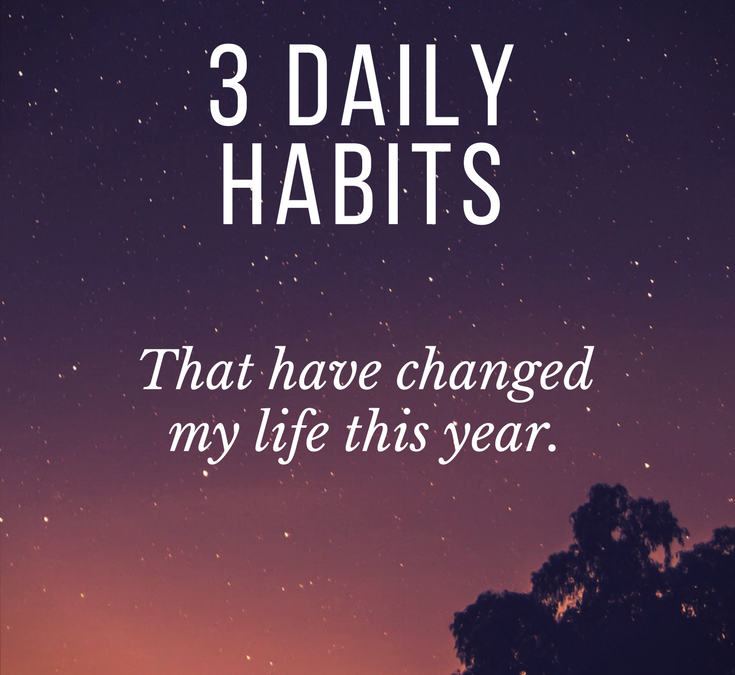 Here are three daily wellness habits I’ve started this year that have changed my life in a big way. I always used to wear a watch, to the point that if I accidentally left my house without it I felt like I was missing a limb. But once cell phones became ubiquitous, I no longer had to rely on my watch to know the time so it didn’t seem worth it to get a new one when my old watch died. That is, until this year. Over the past six months, I’ve become more aware of the amount of time I spend on my phone. 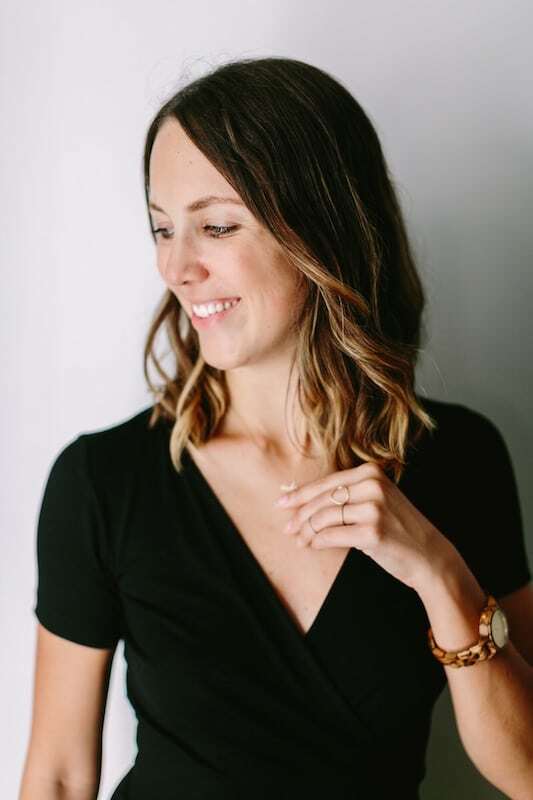 I wrote this post about my morning routine including how I avoid getting on my phone right upon waking up (and after reading Robyn Nohling’s post about keeping cell phones out of the bedroom, I promptly bought an alarm clock). But I still find myself looking at my phone way too often during the day, which makes me less productive and more distracted. As I tried to limit my cell phone use during the day, I realized I couldn’t help it – I needed to know what time it was. And more often than not, when I used my phone to look at the time, a text message or a notification distracted me. It was time to get a new watch. 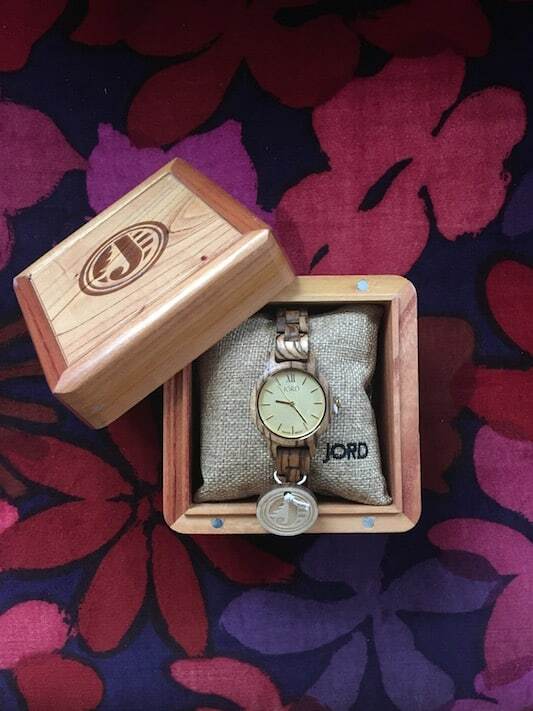 I looked for a new watch for months before settling on this gorgeous wooden watch from JORD watches. I love how unique the watch is, yet still simple enough to wear on a daily basis. After debating between styles and colors (I’m super indecisive!) I ended up choosing the Frank 35 women’s watch with a zebrawood band and champagne colored face. After wearing my wood watch for the last few weeks, I’ve noticed a huge difference in my days. Not only am I much more productive, but my anxiety and feelings of overwhelm have gone way down. When I was in the habit of reaching for my phone so frequently, I didn’t realize how much it affected my stress levels. Now, with the help of my new JORD watch, I am better able to stay present during the day. A good friend said to me recently “What if right where you are is exactly where you’re supposed to be?” With that in mind, I had my watch engraved Be Where You Are, to remind me to be present and aware in the moment. 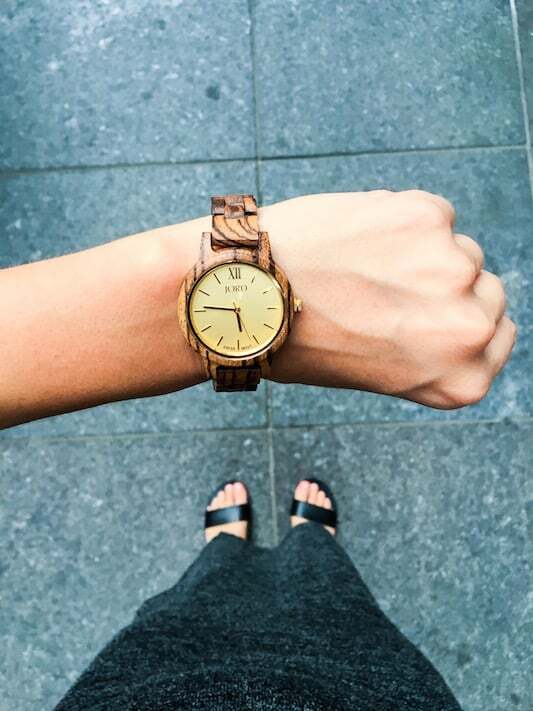 I’m partnering with JORD to give one lucky reader $100 towards any men’s or women’s wooden watch of your choice. Click here to enter my giveaway – you’ll get $25 just for entering! Contest closes on October 29th at 11:59pm. In my quest to not have my phone be the first thing I look at in the morning, and the last thing I see at night, I decided to start journaling. 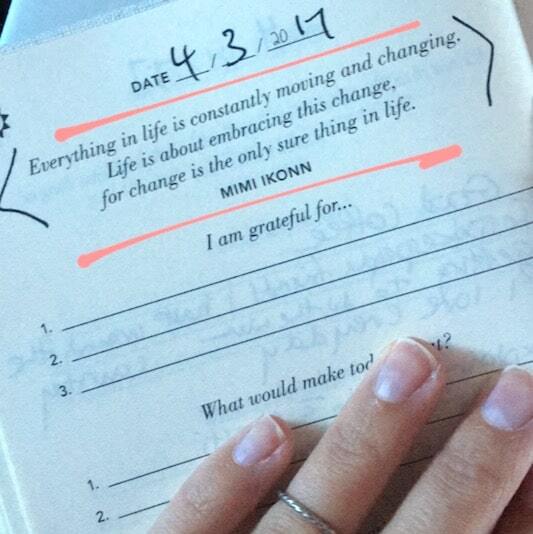 Easier said than done for someone who hasn’t kept a journal since back when it was called a diary (aka 1998). So I chose The Five-Minute Journal for its structure and short entries: just three minutes in the morning and two minutes at night is all you need. It is totally doable and a perfect foray into journaling. Now, instead of lying in bed checking Instagram or emails, I fill out my journal. Each morning it prompts me to reflect on three things I’m grateful for, pick three things that would make my day great, and to write one positive daily affirmation. Starting the day with gratitude (instead of FOMO from scrolling through social media posts) has given me more energy and made me happier overall. I haven’t had a real period in 15 years. Sounds crazy, but stick with me here. I started taking oral contraceptives at age 17 and had no issues with them, so they were a simple birth control solution for me. In my early 20’s, I stopped the pill in order to switch prescriptions and ended up not getting my period back. Four months later, the doctor’s advice was to just start the pill again, the treatment for a missing period. So I did – not really stopping to consider that not getting a period was not normal. A number of factors over the past year have made me consider stopping the pill (and no mom, it’s not because I’m trying to get pregnant). After reading Robyn’s period blog posts, including one about what your period can tell you about health, I decided to finally do it. Robyn recommended using a period tracking app, so I download Flo Health period tracking app (download the app here). 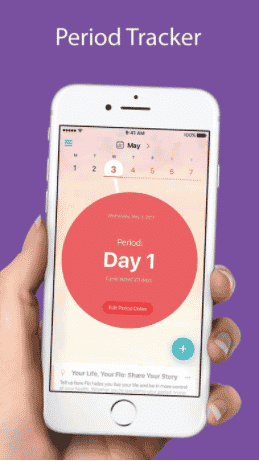 The app tracks your cycle and symptoms and makes predictions as to when you’ll get your period and when you’ll ovulate. After 15 years without a real period, it’s so empowering to learn and understand what is going on in my body throughout the month. I talk a lot about tuning into your body’s intuition when it comes to food and eating, but I never realized how important it is to tune into my reproductive health too. Did any of these daily habits resonate with you? I’d love to hear from you, leave me a comment below and let me know! I love the idea of a 5-minute journal, even for my 8yo! Amazon is selling “Like New: Used” ones! Cannot imagine what one will find a slightly used journal. I would not wear a watch at least half of the time in years past; however I recently started to wear it and as a result I have become more aware of deadlines and have become more organized than I used to be. I enjoyed reading this. For once there is a step I can skip……#3, I don’t think I have that problem. I got a warm, happy feeling reading about that 8 month old’s belly laugh. haha yes you can skip that one 😉 The belly laughs are the BEST! The first thing I did when I retired is not replace my work cell phone. For years I had every electronic gadget available and was available to people 24/7. It’s been three + years now without a cell phone and I am so unstressed. Then I stopped wearing a watch because I don’t care what time it is. I make a list every day of things I plan to accomplish. Next I decided to stop driving. I drove 60,000 a year for work before. I still maintain my license and do drive in an emergency but my wife likes to drive so I’m a professional passenger. Last I no longer carry a wallet. My wife carries my license and ID in her purse. Your mom thinks I’m crazy. Instead of growling old I’m reverting. So far it’s working. I was a Type A personality before with border line high blood pressure. Now everything seems to have fallen into place and life is good.